So far we’ve only written short programs that have a single class and a single method (main). In this chapter, we’ll show you how to organize longer programs into multiple methods and classes. We’ll also present the Math class, which provides methods for common mathematical operations. In mathematics, you have probably seen functions like sin and log, and you have learned to evaluate expressions like sin(π/2) and log(1/x). First, you evaluate the expression in parentheses, which is called the argument of the function. Then you can evaluate the function itself, maybe by punching it into a calculator. This process can be applied repeatedly to evaluate more complex expressions like log(1/sin(π/2)). First we evaluate the argument of the innermost function, then evaluate the function itself, and so on. The first line sets root to the square root of 17. The third line finds the sine of 1.5 (the value of angle). Notice that PI is in capital letters. Java does not recognize Pi, pi, or pie. Also, PI is the name of a variable, not a method, so it doesn’t have parentheses. The same is true for the constant Math.E, which approximates Euler’s number. Converting to and from radians is a common operation, so the Math class provides methods that do it for you. Another useful method is round, which rounds a floating-point value to the nearest integer and returns a long. A long is like an int, but bigger. More specifically, an int uses 32 bits; the largest value it can hold is 231−1, which is about 2 billion. A long uses 64 bits, so the largest value is 263−1, which is about 9 quintillion. The result is 63 (rounded up from 62.8319). Take a minute to read the documentation for these and other methods in the Math class. The easiest way to find documentation for Java classes is to do a web search for “Java” and the name of the class. In Java, the log method always uses base e. So this statement finds the log base e of 10, and then raises e to that power. The result gets assigned to x. The message “cannot find symbol” is confusing, but the last line provides a useful hint. The compiler is looking for pow in the same class where it is used, which is Test. If you don’t specify a class name, the compiler looks in the current class. The name of the class is NewLine. By convention, class names begin with a capital letter. NewLine contains two methods, newLine and main. Remember that Java is case-sensitive, so NewLine and newLine are not the same. Method names should begin with a lowercase letter and use “camel case”, which is a cute name for jammingWordsTogetherLikeThis. You can use any name you want for methods, except main or any of the Java keywords. newLine and main are public, which means they can be invoked from other classes. They are both static, but we can’t explain what that means yet. And they are both void, which means that they don’t yield a result (unlike the Math methods, for example). The parentheses after the method name contain a list of variables, called parameters, where the method stores its arguments. main has a single parameter, called args, which has type String. That means that whoever invokes main must provide an array of strings (we’ll get to arrays in a later chapter). Since newLine has no parameters, it requires no arguments, as shown when it is invoked in main. And because newLine is in the same class as main, we don’t have to specify the class name. You can invoke the same method more than once, and you can have one method invoke another. In this example, main invokes threeLine, and threeLine invokes newLine. Creating a new method gives you an opportunity to give a name to a group of statements, which makes code easier to read and understand. Introducing new methods can make a program smaller by eliminating repetitive code. For example, to display nine consecutive new lines, you could invoke threeLine three times. A common problem solving technique is to break tasks down into sub-problems. Methods allow you to focus on each sub-problem in isolation, and then compose them into a complete solution. When you look at a class definition that contains several methods, it is tempting to read it from top to bottom. But that is likely to be confusing, because that is not the flow of execution of the program. Execution always begins at the first statement of main, regardless of where it is in the source file. Statements are executed one at a time, in order, until you reach a method invocation, which you can think of as a detour. Instead of going to the next statement, you jump to the first line of the invoked method, execute all the statements there, and then come back and pick up exactly where you left off. That sounds simple enough, but remember that one method can invoke another one. In the middle of main, we go off to execute the statements in threeLine. While we are executing threeLine, we go off to execute newLine. Then newLine invokes println, which causes yet another detour. Fortunately, Java is good at keeping track of which methods are running. So when println completes, it picks up where it left off in newLine; when newLine completes, it goes back to threeLine, and when threeLine completes, it gets back to main. In summary, when you read a program, don’t read from top to bottom. Instead, follow the flow of execution. Some of the methods we have used require arguments, which are the values you provide when you invoke the method. For example, to find the sine of a number, you have to provide the number, so sin takes a double as an argument. To display a message, you have to provide the message, so println takes a String. printTwice has a parameter named s with type String. When we invoke printTwice, we have to provide an argument with type String. Before the method executes, the argument gets assigned to the parameter. In this example, the argument "Don't make me say this twice!" gets assigned to the parameter s.
Sometimes Java can convert an argument from one type to another automatically. For example, Math.sqrt requires a double, but if you invoke Math.sqrt(25), the integer value 25 is automatically converted to the floating-point value 25.0. But in the case of printTwice, Java can’t (or won’t) convert the integer 17 to a String. Parameters and other variables only exist inside their own methods. Inside main, there is no such thing as s. If you try to use it there, you’ll get a compiler error. Similarly, inside printTwice there is no such thing as argument. That variable belongs to main. Because variables only exist inside the methods where they are defined, they are often called local variables. But that format (without the second int) is only legal for variable declarations. In parameter lists, you need to specify the type of each variable separately. printTime has two parameters, named hour and minute. And main has two variables, also named hour and minute. Although they have the same names, these variables are not the same. hour in printTime and hour in main refer to different storage locations, and they can have different values. Before the method is invoked, Java evaluates the arguments; in this example, the results are 12 and 0. Then it assigns those values to the parameters. Inside printTime, the value of hour is 12, not 11, and the value of minute is 0, not 59. Furthermore, if printTime modifies one of its parameters, that change has no effect on the variables in main. One way to keep track of everything is to draw a stack diagram, which is a state diagram (see Section 2.3) that shows method invocations. For each method there is a box called a frame that contains the method’s parameters and variables. The name of the method appears outside the frame; the variables and parameters appear inside. Figure 4.1: Stack diagram for PrintTime. As with state diagrams, stack diagrams show variables and methods at a particular point in time. Figure 4.1 is a stack diagram at the beginning of the printTime method. One of the nice things about Java is that it comes with an extensive library of classes and methods. But before you use them, you might have to read the documentation. And sometimes that’s not easy. As an example, let’s look at the documentation for Scanner, which we used in Section 3.2. 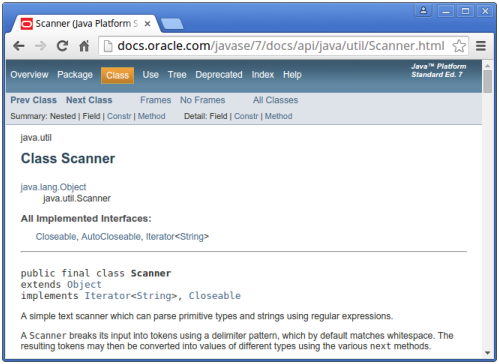 You can find it by doing a web search for “Java Scanner”. Figure 4.2 shows a screenshot of the page. Figure 4.2: Screenshot of the documentation for Scanner. Documentation for other classes uses a similar format. The first line is the package that contains the class, such as java.util. The second line is the name of the class. The “Implemented Interfaces” section lists some of the things a Scanner can do; we won’t say more about that for now. The next section of the documentation is a narrative that explains the purpose of the class and includes examples of how to use it. This text can be difficult to read because it uses terms we have not learned yet. But the examples are often very useful. A good way to get started with a new class is to paste the examples into a test file and see if you can compile and run them. Ways of creating, or “constructing”, a Scanner. The list of methods that Scanner provides. More information about how to create a Scanner. More information about each method. public int nextInt() Scans the next token of the input as an int. The first line is the method’s signature, which specifies the name of the method, its parameters (none), and what type it returns (int). The next line is a short description of what it does. The “Returns” section describes the result when the method succeeds. In contrast, the “Throws” section describes possible errors and their resulting exceptions. Exceptions are said to be “thrown”, like a referee throwing a flag, or like a toddler throwing a fit. It might take you some time to get comfortable reading documentation and learning which parts to ignore. But it’s worth the effort. Knowing what’s available in the library helps you avoid reinventing the wheel. And a little bit of documentation can save you a lot of debugging. As you benefit from reading good documentation, you should “pay it forward” by writing good documentation. A nice feature of the Java language is the ability to embed documentation in your source code. That way, you can write it as you go, and as things change, it is easier to keep the documentation consistent with the code. If you include documentation in your source code, you can extract it automatically, and generate well-formatted HTML, using a tool called Javadoc. This tool is included in standard Java development environments, and it is widely used. In fact, the online documentation of the Java libraries is generated by Javadoc. Javadoc scans your source files looking for specially-formatted documentation comments, also known as “Javadoc comments”. They begin with /** (two stars) and end with */ (one star). Anything in between is considered part of the documentation. The class comment explains the purpose of the class. The method comment explains what the method does. Notice that this example also includes an inline comment, beginning with //. In general, inline comments are short phrases that help explain complex parts of a program. They are intended for other programmers reading and maintaining the source code. In contrast, Javadoc comments are longer, usually complete sentences. They explain what each method does, but they omit details about how the method works. And they are intended for people who will use the methods without looking at the source code. Appropriate comments and documentation are essential for making source code readable. And remember that the person most likely to read your code in the future, and appreciate good documentation, is you. A value that you provide when you invoke a method. This value must have the same type as the corresponding parameter. To cause a method to execute. Also known as “calling” a method. A piece of information that a method requires before it can run. Parameters are variables: they contain values and have types. The order in which Java executes methods and statements. It may not necessarily be from top to bottom, left to right. The process of assigning an argument value to a parameter variable. A variable declared inside a method. Local variables cannot be accessed from outside their method. A graphical representation of the variables belonging to each method. The method calls are “stacked” from top to bottom, in the flow of execution. In a stack diagram, a representation of the variables and parameters for a method, along with their current values. The first line of a method that defines its name, return type, and parameters. A tool that reads Java source code and generates documentation in HTML format. Comments that describe the technical operation of a class or method. The code for this chapter is in the ch04 directory of ThinkJavaCode. See page ?? for instructions on how to download the repository. Before you start the exercises, we recommend that you compile and run the examples. If you have not already read Appendix A.4, now might be a good time. It describes an efficient way to test programs that take input from the user and display specific output. The point of this exercise is to practice reading code and to make sure that you understand the flow of execution through a program with multiple methods. What is the output of the following program? Be precise about where there are spaces and where there are newlines. Hint: Start by describing in words what ping and baffle do when they are invoked. Draw a stack diagram that shows the state of the program the first time ping is invoked. The point of this exercise is to make sure you understand how to write and invoke methods that take parameters. Write the first line of a method named zool that takes three parameters: an int and two Strings. Write a line of code that calls zool, passing as arguments the value 11, the name of your first pet, and the name of the street you grew up on. The purpose of this exercise is to take code from a previous exercise and encapsulate it in a method that takes parameters. You should start with a working solution to Exercise 2. Write a method called printAmerican that takes the day, date, month and year as parameters and that displays them in American format. Once you have debugged printAmerican, write another method called printEuropean that displays the date in European format.